More than 100 coders and observers gathered for a 24-hour, intense coding event. Read the recap and see who won here. 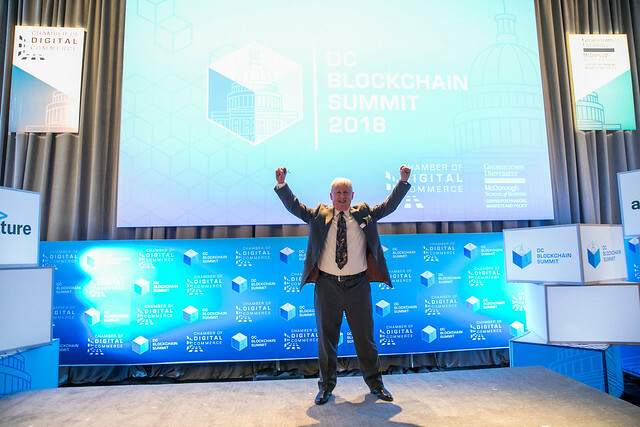 Discover Blockchain Technology code-a-thon winning teams gather on-stage to present their solutions and receive recognition at the DC Blockchain Summit 2018. The Chamber of Digital Commerce, Discover, and Georgetown University’s McDonough School of Business Center for Financial Markets and Policy, will host a 24-hour code-a-thon to explore the promise of blockchain technology. Participants will tackle and deliver innovative ideas to address: payments, RegTech and digital identity. Join us as we recognize the finalists of the Discover Blockchain Technology code-a-thon. Learn what teams of engineers and coders were able to deliver in this intense code-a-thon to tackle solutions and develop new solutions to address payments, RegTech and digital identity. Can blockchain transform the federal employment experience? This session will provide insights into how the U.S. Office of Personnel Management is enabling more secure and transparent employee digital records leveraging IBM’s blockchain technology solutions. Decentralized networks are an important innovation in protecting users across digital asset exchanges. Learn how Exchange Union’s technologies and XUC token allow exchanges to make instant, trustless trades directly with one another in a secure and decentralized environment. Blockchain has major implications for verifying the origin of food. For instance, by combining internet of things (IoT) sensors with a blockchain tracking system, you could prove where an agricultural product came from. Want to know if the grapes in your Champagne were really grown in Champagne, France? Or if that Alaskan-caught salmon is really from Alaska? This session will provide insights into how blockchain is poised to transform the agricultural supply chain. Blockchain is a uniquely disruptive force for the enterprise. This session will focus on enterprise level uses cases, as well as how blockchain technology may be integrated with existing IT systems to empower organizations in the near term, and on the road ahead. Can blockchain technology really become the infrastructure for the financial services industry? PeerNova’s President and CTO Gangesh Ganesan will describe how practical applications are transforming major financial institutions, and the implementation of its Cuneiform platform. Blockchain is a powerful innovation that is poised to bring substantial positive change to the financial services industry, among others. Entrepreneurs, investors and policymakers are increasingly interested in blockchain technology not only for its potential to transform the way we conduct business, but also for its inherent cyber security benefits. Microsoft and the Chamber will unveil a white paper intended to kick off a dialogue, between industry and regulators, about the steps necessary to improve cybersecurity and advance blockchain usage in the financial services industry. Anti-money laundering laws protect the financial system and fight crime. However, compliance is expensive, causing some financial institutions to stop providing services to higher risk customers for cost reasons. This concept of “de-risking”—which forces millions of people out of the financial system—has led to a large population of individuals with no other option but to use less regulated alternatives. This panel will discuss the tension between security and inclusion, where the right balance should be, and how blockchain factors into that equation. Our world is becoming more and more digital every day. To fully participate in modern society, a digital identity is now required. However, most of the infrastructure that supports identity hasn’t matured past physical documents and fragmented and redundant data structures managed by others. A solution pattern is emerging that could create safe and effective digital identities that are based on a combination of new technologies including blockchain and biometrics. To bring new innovation to the world of Identity, engaged public / private partnerships will be required to tackle this challenge from every angle and ensure that everyone has access to our modern digital societies. Q4 2017 was an explosive quarter in the blockchain industry. CoinDesk’s Kevin Worth, CEO, presents the major events that took place in the quarter that topped off the year for the most interesting story in finance in the world. Smart contracts hold tremendous promise for simplifying transaction settlement and improving efficiencies. But, do they spell the end to the written legal contract? In this session we will explore legal aspects of smart contract applications, and discuss recent legislative efforts to recognize the validity of smart contracts and records executed on a blockchain. What sort of machine learning/AI applications are possible with distributed ledger data systems, and how do blockchains change the way we look at and analyze big data? What is the potential for this technology to solve real-world problems in the modern healthcare landscape, and how can blockchain technology be used to turn the tide of the opioid crisis? For eighteen years, Edelman has conducted its annual Trust Barometer study, gauging the global levels of trust in industries and institutions. Since 2017, the firm has asked about trust in high-interest technology categories, including blockchain. This brief overview will give a sense for the opportunities and challenges faced by a technology that aims to redefine trust itself. The industry continues to seek approval from the SEC for bitcoin-based ETFs as regulators and stakeholders seek to better understand how the products will operate and be valued in existing markets. This fireside chat will explore the potential listing of ETFs based on bitcoin and other blockchain-based assets and what will be needed to enable its evolution into a traditional financial product. Cryptocurrencies multiplied in value and gained widespread attention throughout 2017. However, this is only the beginning. This panel will delve into the objectives and direction of industry in connection with bitcoin futures and options, and the exchanges on which they are traded. Recent developments at the CFTC will also be discussed, including the self-certification process and “actual delivery” guidelines in retail commodity transactions. It’s all about options and seeking the futures! The Tokenization of Things is upon us. This presentation will provide a historical backdrop on what led to a Cambrian explosion of innovation in finance and money, including the current state of cryptocurrencies (the good, the bad and the forking). Hear how ICOs are evolving through regulation, adoption and hype, and key tokenization use cases (money, identity, web services, securities, real estate, artists, brands, etc.) and a glimpse of what our future may hold. Join us for a discussion of a number of key issues related to Initial Coin Offerings (“ICOs”) focused on recent developments in the ICO securities and commodities landscape. Highlights will include implications for market participants and regulatory enforcement as well as a discussion of key terminology. Digital Identity for Blockchain – What requirements for identity does blockchain create? Establishing digital identities may be one of the most promising use cases for blockchain technology. This panel will cover the need for digital identity enabled by blockchains; the potential legal, regulatory, technological, and adoption challenges associated with those needs; and where we have seen progress. As blockchain technology begins to reshape the financial services industry, other industries are beginning to take notice. While many are viewing the technology as a cost or risk mitigation tool, some are beginning to define a whole new frontier of services and monetization models. The intersection of the physical world with blockchain is one of those frontiers. Messari aims to build an open and reliable data library for cryptoassets. Founder Ryan Selkis discusses his team’s approach to bringing transparency, data standardization and self-regulation to the industry. But is it even possible to enforce certain disclosure standards in a global asset class where regulatory jurisdiction is unclear? Among “the world’s best blockchain conferences and expos to attend”.